The Safety Centre are pleased to introduce the new Apollo EN54-23 approved selection of combined sounder and VAD beacon bases to our product portfolio. These units are ideal for alerting hearing impaired persons within a building that the fire alarm system has been activated. For more information on the Apollo EN54-23 range contact us NOW on 01200 428 410 or use out Livechat facility below. 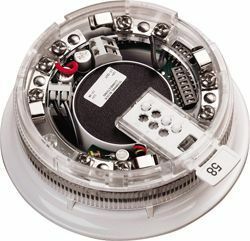 The Apollo 45681-705 is the new EN54-23 approved combined sounder and VAD beacon. This unit is designed for use on Apollo XP95 protocol fire alarm system loop circuits. The integral beacon has a flash rate of 0.5Hz which is ideal for getting the attention of hearing impaired persons within a building. This device features an integral isolator and utilises the Apollo Xpert card method of addressing. The Apollo 45681-700 is the Discovery version of the new EN54-23 approved commbined sounder and VAD beacons. This device is designed for the Apollo Discovery protocol and features the same acoustic and VAD self-test facility of the XP95 EN54-23 approved version. If you’re interested in these products you may also be interested in our Portable LED Lighting and Paging Systems ranges.